The Reports menu within the Assets module of the SapphireOne accounting software provides a complete and comprehensive overview of your Asset Registry. This reporting function allows for the generation of reports that can be used for all levels of asset management. History Audit Reports consists of two functions. These are: Asset Transactions and Asset Audit Lines. This allows the printing of reports, with different levels of details about the assets from the master record. Print simple or detailed reports for both tax and company depreciation methods. Review assets for a current period or historically based on your primary or secondary depreciation method including historical cost, depreciation period and total to date data. Allow management to review reports designed to assist in the control and tracking of your assets during various events that occur in the life of an asset. Allows the printing of a one-line Transaction Reports, or an audit trail type Detailed Report. The Asset History Valuation Report produces reports about an asset’s valuation. Each method is listed and a Wide Report can be printed. Produce an ATO approved Asset Capital Allowance Schedule for end-of-year tax purposes. Review all Historical Transactions in the database relating to Assets. Allow management to track changes in the valuation of an asset by period. The Report menu of assets module allows a complete and comprehensive overview of companies Asset Registry. Provides a summarised or detailed Asset Report, with the ability to print labels included. Provides a summarised or detailed report for the two principle depreciation methods applicable to your data file. Provides a detailed report for the various depreciation methods applicable to your data file. Provides a summarised overview of assets based on the primary depreciation method including historical cost, depreciation period and total to date data. Provides a summarised or historical Depreciation Report based on Primary and Secondary methods for the current period. Provides an Asset Control Report for internal use. This function provides historical reports into Assets. This function provides historical valuation reports into Assets. There are three reports and these reports comply with the ATO reporting requirements for depreciating assets: Depreciating Assets, Low-Value Pool and Capital Allowances schedule for the current year. Provides a summarised and audit style report. The Asset Valuation report allows the printing of detailed reports for the two principle depreciation methods. 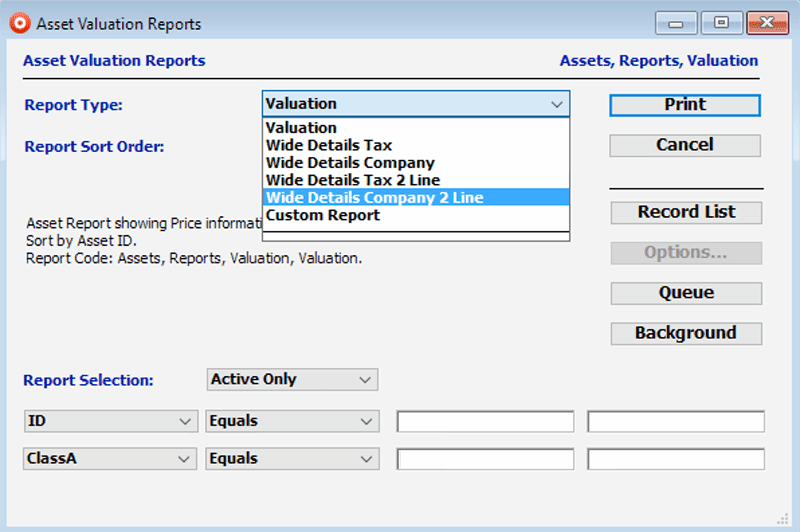 The Valuation Report prints a simple report with totals only. The Wide version prints a very detailed type of report about the selected asset/s. The Wide Report is a landscape report that will need to be reduced, due to the amount of detail provided. This may be achieved through page set-up. The report can be generated using a Report Type of Wide Details Tax 2 Line. 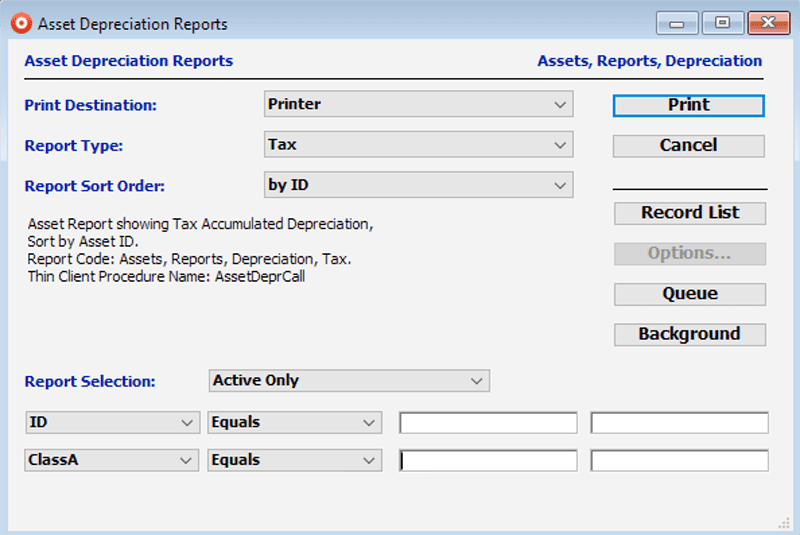 Asset Depreciation function from Assets Reports allows the printing of Depreciation Reports showing TTD, profit/loss and capital gain on disposal. In the Print Destination drop-down menu, the last option will generate a tab delineated text file which may be opened by any spreadsheet program. This function allows the printing of Depreciation Report for the prior year or the current financial year, for each asset. The report can be generated using the defaults, Report Type, Depreciation and a Report Sort Order by ID. This function allows the printing of reports designed to assist in the control and tracking of your assets during various events that occur in the life of an asset. These events are listed in the Report Types drop down menu. Worksheet 2: Low-value pool and Capital allowances schedule for the current financial year. The Capital allowances schedule for current financial year option will print out the report as seen below ready for lodgement with the ATO in Australia. The HISTORY Menu is used to inquire into various historical information or data for assets. Two functions of the History section are Asset Transaction and Asset Audit Lines. Asset Transactions provides a list of all Historical Transactions in the database relating to assets including the current period. Asset Audit Lines allows you to track changes in the valuation of an asset by a period.